Simulating a hazardous crime scene, FBI agents collect key evidence at Kaneohe Bay Dec. 3 during the annual Patriot Palm exercise. More than 40 FBI agents flew from the bureau’s Los Angeles Division to Oahu to practice conducting an investigation in an unstable environment. In recent years, Ricin has become increasingly seen as a poison used in domestic criminal activity and as an agent of terrorism, but is it suitable as a Weapon of Mass Destruction? Many of the incidents in the U.S. have been “the stuff that movies are made of” including the December 2017 incident in a Vermont retirement community; the May 2013 letters to President Obama and Mayor Bloomberg by a jilted relatively unknown actress; the April 2013 letters to a Mississippi Judge, a Mississippi Senator, and President Obama by a conspiracy theorist taekwando instructor attempting to implicate an Elvis impersonating conspiracy theorist; the November 2011 plot by four men, ages 65 to 73, in Georgia with varied terrorism plans including releasing Ricin from an airplane and deploying via explosive devices; and many more. The highest profile uses of Ricin as assassination tools include the 1978 assassination of Georgi Markov in London via injection with a weaponized umbrella and the attempted assassination of Boris Korczak in Virginia in 1981. Recipes for the production of Ricin toxin from the castor bean are prevalent across social media and within Anarchist/Terrorist literature. Ricin is a highly toxic material when inhaled or injected but much less deadly when ingested. Ricin toxicity via inhalation begins with wheezing, difficulty breathing, and tightness in the chest resulting in pulmonary flooding and inflammation leading to death. Toxicity via injection (or intramuscular) results in pain at the injection site, nausea, vomiting, fatigue, and fever followed by hemorrhage, shock, and renal failure resulting in death. Toxicity via ingestion includes some of the same symptoms of injection, but more focused towards the gastrointestinal symptoms such as vomiting, diarrhea, heartburn, abdominal pain, esophageal pain; it eventually finds its way into the bloodstream and other organ systems before death. Ricin is most dangerous as an inhalation hazard; therefore, protection of the responder’s airway should take priority. In an area where the hazards are not fully characterized or are considered unknown, a self-contained breathing apparatus (SCBA) is required. If the ricin was not dispersed as an aerosol and airborne concentrations are not high, a full-face respirator (with a P100 filter) or a powered-air purifying respirator (with a HEPA filter) can be employed. Ricin, a particulate threat, does not easily penetrate unabraded skin; therefore, the dermal protection can be as simple as a coverall or an ensemble certified against NFPA 1994, Class 4 or NFPA 1999 Multi-Use ensemble (Blauer Class 4). 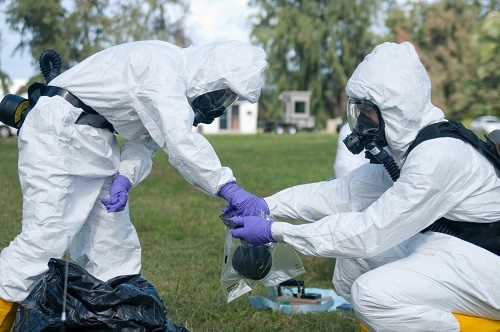 Care should be taken to thoroughly characterize other threats in the response area to ensure there are no solvent or caustic materials that would drive a higher level of skin protection (likely NFPA 1992 ensembles such as the Blauer Multi-Threat or the Saint Gobain ONESuit Shield). Due to the high inhalation threat associated with Ricin, it would be prudent to introduce technologies that allow the operator to work more closely with samples while retaining an enhanced protective posture. When sampling for Ricin, it is imperative that the material not be unintentionally aerosolized. Seacoast Science’s Bulk Powder Vacuum is designed for high-efficiency collection of powder evidence. The device has a modular design consisting of a reusable vacuum handle with detachable single-use collection nozzles. This design makes the collection process easy while reducing potential cross-contamination and exposure to the user. If a vacuum sampler is not feasible, the MRI Global User-Configurable Portable Glove Box (PGB) employs flexible-wall construction with an internal frame for support that is both lightweight and rigid. There are many tools available for the detection or Ricin. The devices range from hand-held assays such as the ANP Technologies, Inc. NIDS 3000, to cell-based signaling systems such as the PathSensors BioFlash and Zephyr products, and finally to polymerase chain reaction systems, such as the BioFire FilmArray Biosurveillance System. Evaluations of all these systems have been performed by the Department of Defense and the Pacific Northwest National Laboratory in partnership with the Department of Homeland Security. Ricin is not considered a dermal hazard; however, any contact with the toxin should be minimize by washing the skin with soap and water as soon as feasible. There are several ways to quickly and efficiently destroy the protein toxin. Dahlgren Decon and Decon 7 are able to destroy Ricin within 10 minutes of contact time, per Department of Defense testing. pH Amended Bleach: Using a solution of 1 part household bleach (5.25 – 6%), 1 part white vinegar, and 8 parts water, pH amended bleach requires at least 30 minutes contact time with the toxin and works best when the surface contamination is minimized, the temperature is greater than 70°F and the humidity is greater than 80%. Fumigation: 500 ppm chlorine dioxide will destroy the toxin in 20 minutes when the temperature is maintained at 25°C and the relative humidity is maintained at 80%. Thermal Destruction: Heating surfaces to 200°F for 24 hours at 80% relative humidity will destroy the toxin. If the toxin is in a water matrix, heating to 80°C for 30 minutes will destroy the threat material.